Biarritz is the most popular city in this region – a sunny city on the Atlantic, with a collection of impressive seaside castles, beaches, and winding alleys crammed with shops and tourists. Along the shoreline of Biarritz, some historical architectural masterpieces feel the spray of the waves. Among them is the empress Eugenie’s castle (wife of Napoleon III). Groups of beginner surfers could be seen lined up on the sand, receiving instructions from the surf teacher. By the sea, we ate poulet basquaise for lunch, a local chicken dish cooked in tomato and capsicum, served with fries. 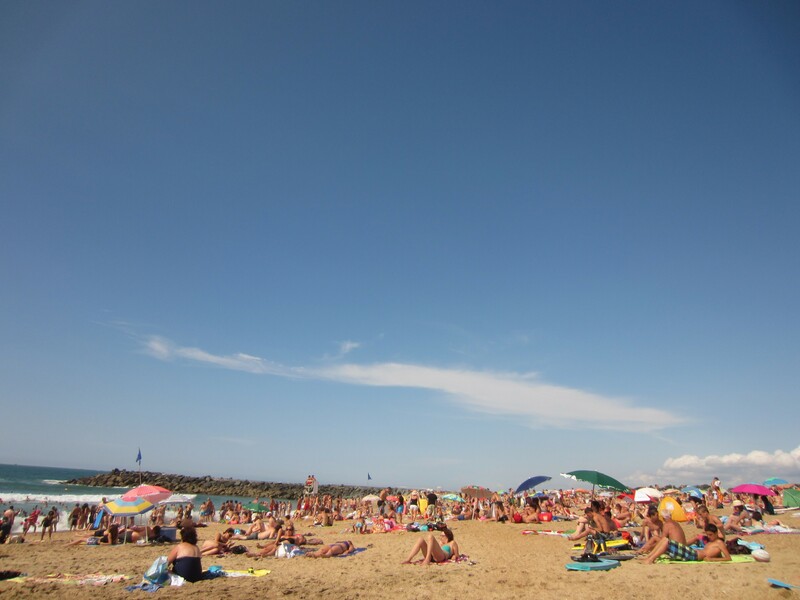 We put our towels down on Anglet beach, a short drive away, one of many beaches running up the coast away from Biarritz. With French summer light lasting well until 10pm, the beach was empty when we arrived in the morning (nobody was in a rush, with still so much day ahead). As the sun arced through into the afternoon, the beach got busier and busier, blooming with colourful umbrellas and beach towels and children until it became a jam-packed Where’s Wally scene. 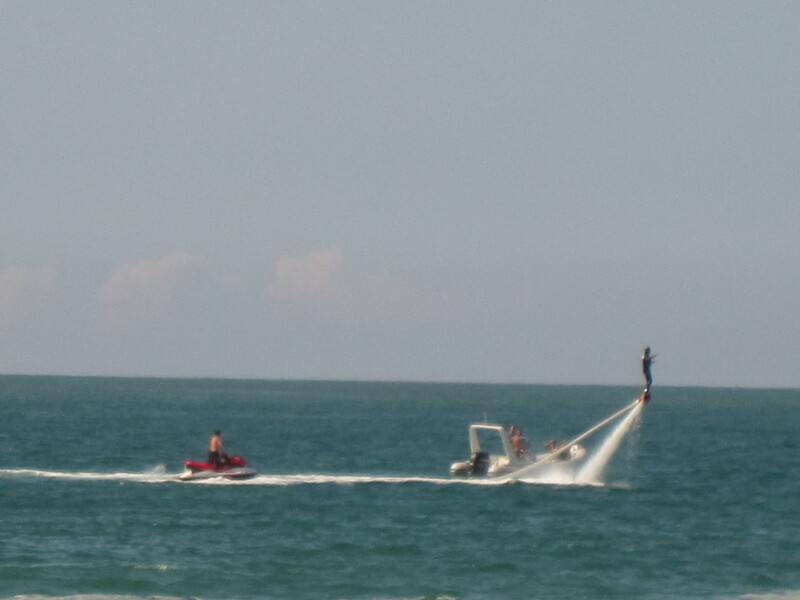 I was transfixed by some guy off shore, playing with some kind of jetpack. Presumably, training to be a superhero. We were staying in nearby Sare, a tiny, sleepy town at a juncture between winding mountain roads. It was ridiculously pretty. In the morning, the new light fell across Sare through a haze of low-lying clouds, which floated between the trees. Nearby, the sun would glint off pale terracotta tiled roofs of houses and homestays, and beyond, green hills rolled and culminated in impressive mountain peaks. I witnessed it all through the squeaky wooden windowframes of the hotel (so charmingly old-world, that they didn’t even close properly), and my imagination was running wild a little bit. It looked like some Roman province, and I could almost picture local legionnaires patrolling the marketplace as farmers traded pottery and livestock. This part of France was Basque country, with it’s own language and traditions, and aspirations for independence from France (even considering it’s own currency). Each house shared the same Basque architectural style; heavy stone walls, painted white, with red-brown cross beams and shutters. The steepled church had a tiny graveyard, and several statues. 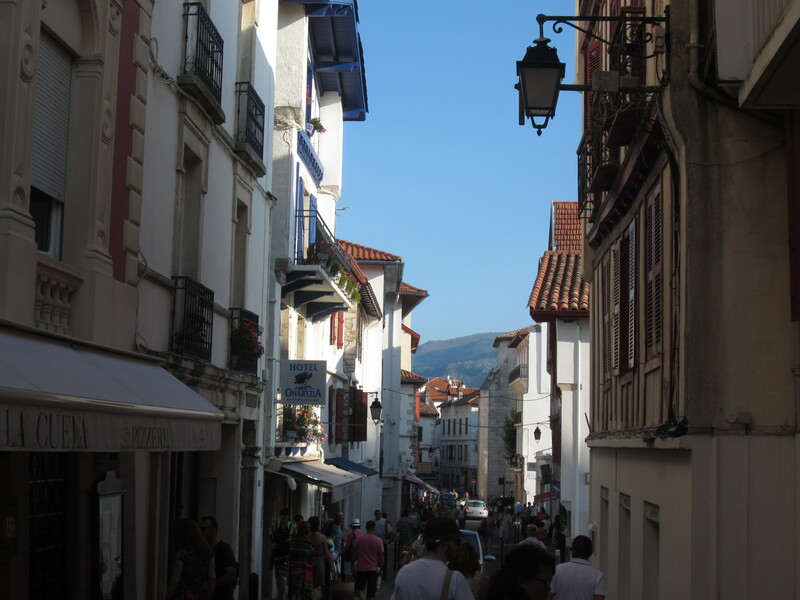 Lively restaurant terraces gathered around the town’s main square, as did a few small stalls selling gateaux basques, a type of flat cake typical of the region. The countryside was all around, and the town centre quickly led into cornfields via bumpy cobbled ways. Spain was so close, I could almost smell the paella. 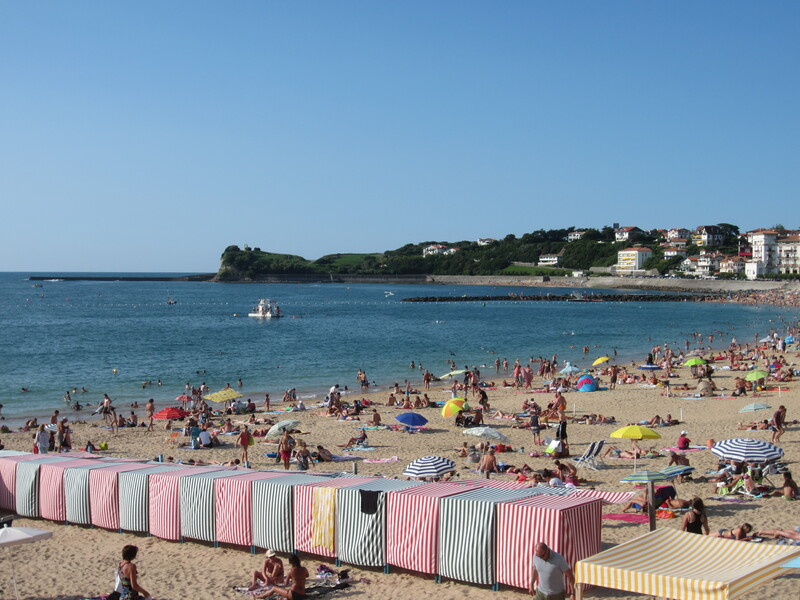 We finished the day at Saint-Jean-de-Luz, the next town along the coast. Like Biarritz, but not quite so big, it certainly made up for it with the number of people. It had an old town of narrow walking streets, chocolate shops, cheese tasting, leaning buildings and decorative cast-iron street lamps. The beach was crammed with people as the blinding sun cooled off and set into golden hour. Kids were playing out on offshore pontoons and families were packing up after a long day in the sun. We ordered a round of fruit shakes. A big day out, the French beach experience. The Basque Country is definitely one of my favorite place in France (with Annecy)!!! Like you said, it was ridiculously beautiful! Reading your article just remind me of all these nice smells, 10pm sun, the poulet basquaise! Awesome article Derrick! Next time, i’ll bring you to Annecy and Gorge du Verdon! 🙂 Maybe even Corsica! Yeah!! There’s so much of France yet to see! The Alps are a good start and yes Annecy is number one on my list of places to see when we go back 🙂 Oh yeah I should mention the smells of the place, the food, the grass in Sare, it brings it to life!